It’s no secret I’m an avid League of Legends player, so when several years ago it was announced Blizzard would be entering the Multiplayer Online Battle Arena genre with what was then simply called “Blizzard DOTA” and then “Blizzard All-Stars”, I was excited. Flash forward a few years and that game is finally playable, albeit under a different name, new gameplay mechanics, and locked behind a Blizzard invitation due to the game’s technical alpha status. After what seemed like an eternity of watching friends and acquaintances receive invites, I finally joined the increasingly less exclusive Heroes of the Storm club earlier this week. Now that I’ve spent more time playing this alpha in the last two days than I have playing many full release games, I can safely say Blizzard has once again done what it does best, crafting a MOBA with plenty of depth and complexity but at the same time eliminating many of the elements that can serve as a barrier for newcomers to the genre. Heroes of the Storm will be instantly familiar to players of League of Legends of DOTA 2 — you choose a hero ( in this case a variety of heroes and villains from Blizzard’s core Warcraft, Starcraft, and Diablo franchises), waves of minions push towards opposing bases, and there are towers that must be destroyed to move forward. The similarities for the most part end there. Unlike many other MOBAs following in the footsteps of LoL and DOTA, looking to carve a place in what is becoming a quickly crowded genre, Heroes of the Storm is legitimately much different. First up on the traditional MOBA chopping block is last hitting and farming. Rather than personal gold or experience, your team collectively levels up, incentivising teamwork and removing the need to run around in circles while you wait to hit a minion when it reaches 10 HP. Because experience is shared, you will want a member of your team in every lane to soak up experience, but other than that who goes where or does what is more up in the air than in most MOBAs. In another departure, players also start the game with their three core abilities, unlocking the choice between two ultimate abilities for the fourth later in the match. There is no need to figure out what skills you want to level up first either — each ability scales with your level, and each player comes equipped with a mount that can be summoned for increased movement speed. 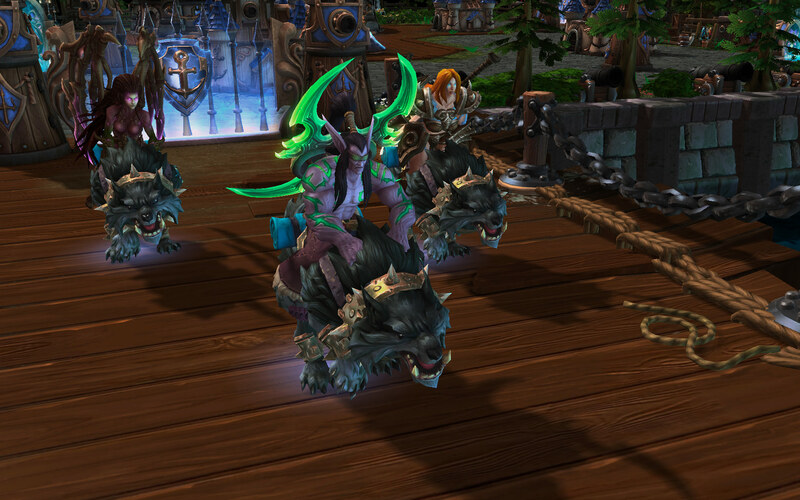 Without gold to purchase items or abilities to choose and level up, what ways are there for customizing your hero? After all, experimenting with crazy item builds is part of what makes MOBA games so addicting, as there is always a new build or strategy to try. Blizzard realizes this and provides an answer with the game’s talent system. Upon leveling up, you are often presented with a choice between two or more modifiers that will determine what your character excels at. Some talents increase stats like health and attack damage, others modify existing abilities and some even grant a completely new ability to add to your arsenal. While complete role variation is much more difficult in Heroes than in League of Legends (a support for example will have a very hard time going toe to toe with an assassin, regardless of build), you can build a support with a focus on damage, or an assassin with an emphasis on dealing extra damage to enemy structures. Perhaps the biggest difference between Heroes and other titles are the battlegrounds you will be duking it out on. Rather than the often seen 3 lane format that is almost exclusively played in other MOBAs, Heroes of the Storm features several maps, each with different lane numbers and jungle layouts. More importantly, each maps features a unique and vitally important gameplay mechanic that if ignored will quickly turn the tide of the match against you. 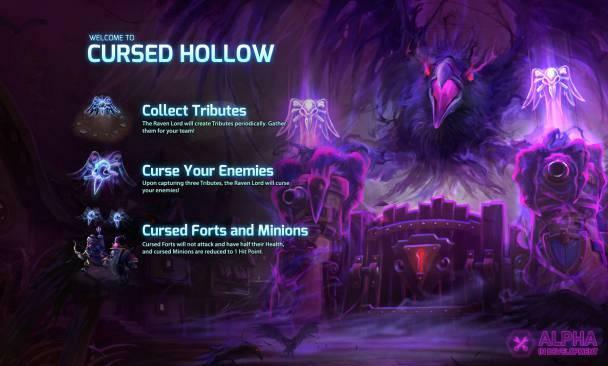 One map, called Cursed Hallow, has players gathering tributes to the Raven Lord, who then reduces the HP of all enemy minions to 1 and the health of enemy forts by half for a limited time. The Dragon Shire map tasks players with capturing shrines in order to have one of their team members transform into a massive and resilient dragon knight, capable of punting enemy players long distances and excellent for pushing. Each of the objectives are of vital importance, and serve to naturally bring together teams for fights as each attempts to claim the objectives. Presentation is just icing on the cake for a game like this, but Heroes even in Alpha looks great and packs style, from the rocking menu music to the character banter between heroes and enemies. 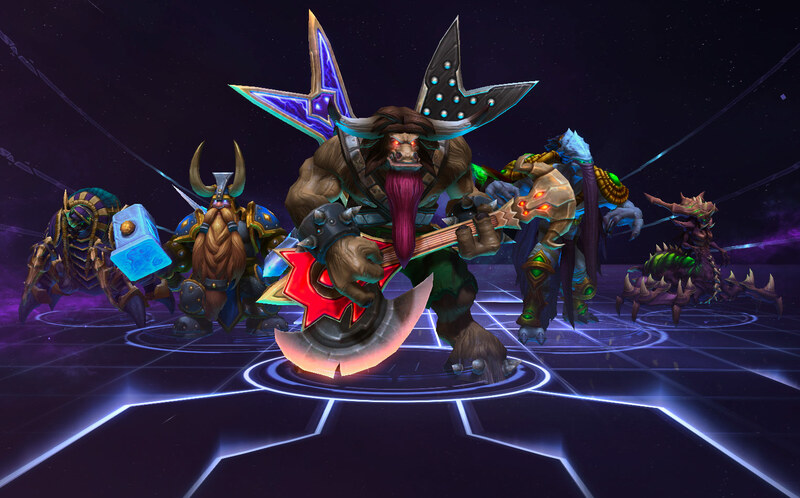 Much of the magic of Heroes of the Storm comes from the characters themselves. In the same way that there is just something great about seeing Link face off against Mario in Super Smash Bros., watching your favorite Blizzard characters team up and face off is definitely a selling point that other MOBAs can’t match.The games progression system takes what Blizzard has learned from years of World of Warcraft and their recent success with the digital card game Hearthstone, using daily quests and hero specific challenges to keep players coming back. Being a Free to Play title, a number of skins are available to customize the look of your favorite hero for a price, but completing hero quests unlocks some free character customization options in the form of recolors. There will be many in the MOBA community who will call Heroes of the Storm “dumbed down” or “casual.” Players looking for the relentlessly unforgiving gameplay of a game like DOTA 2 will no doubt be dumbfounded by the lack of items and balk at the idea of shared experience. While Heroes of the Storm does indeed lower the barrier of entry for first time MOBA players, that isn’t a bad thing. Even at this extremely early stage, seasoned MOBA veterans will find plenty of strategy, customization, and just plain fun to keep them occupied for hours on end, and if that’s the case, what is there to really complain about?